Week-end Skiff 12 - row boat for plywood stitch and glue, tack and tape or foam sandwich. This DIY plywood boat can be built in one long week-end. Many options: materials, different building methods. 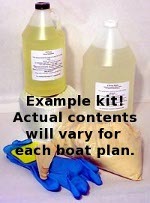 Scroll down to see the row boat kits available for this boat. The plans package includes dimensions in inches and metric.